MR Sizlin Rose comes from generation after generation of herdsire greatness, on both his maternal and paternal lines. 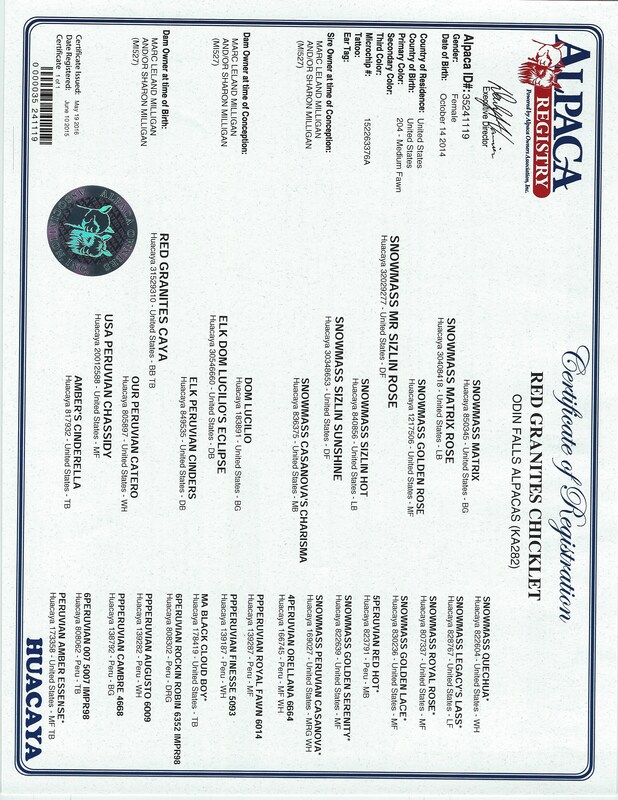 With males like Matrix Rose, Matrix, Quecha, 6Peruvian Accoyo Elite, 4 Peruvian Legacy, Royal Rose, Sizlin Hot, comes proven progeny excellence. MR Sizlin Rose is the first Matrix Rose son born on Red Granite Ranch. We are proud to offer him as a representation of Matrix Rose and his abilities to produce champions. MR Sizlin Rose is a compact male with extremely bright fleece, full of high frequency medium amplitude micro bundles. He is very dense with an amazing handle. MR Sizlin Rose is proven with 4 absolutely gorgeous cria on the ground and many on the way. All 4 cria will be at the auction for your preview. MR Sizlin Rose is a 12 time Color Champion. This includes the 2012 AOBA National Show Brown Champion and 2012 Futurity Brown Champion. Red Granite Ranch will retain 10 future breeding with this sale, to MR Sizlin Rose. After GWAS 2016, spent the night at Red Granite Ranch on the way home. After a wonderful cup of coffee the next morning, we went out to look at some of their incredible females, and there she was. Marc was showing me some other females but Chicklet stood out in the crowd of a few hundred girls. I had to have her!!!! Turns out she was The Futurity 1st place and Reserve Champion in 2016 and after a breeding to Kirwin, she's been wining nothing but 1st place ribbons. After her 2017 cria, she will be bred to the one and only Red Granites Val D Lsere for what could be an incredible combination.